One word springs to mind - Amour! The ever beautiful and unique jewellery designs of the incredibly talented A Peace Treaty have been revealed in their Spring/Summer 2014 statement jewellery collection, now available at Apache Rose London. Constantly surprising their fans with the diversity of their collections, this one named 'Tavla', cleverly fuses two completely opposing cultures, with inspiration being drawn from both the Ottoman empire and that of the youthful rebellious period of 1960's Britain. This pairing sees retro materials like coloured resins being fused together with traditional Eastern stones such as Tiger Eye, Malachite, coral and agate. An unlikely paring but one that works exquisitely. Combine these materials with the designer's signature use of gold and silver plated brass and you have a designer jewellery collection worth celebrating a thousand times over. Dramatic, circular statement earrings are given a lovely, fresh Summery feel with the combination of minty green resin and classic silver in the Badia design. Or maybe you prefer the richer, warmer gold and amber version? Matching necklaces are put forth in the Akef design, which demonstrate a unique 22" midway length (we're big fans!). The Sentinel necklace is luscious and long and has a tribal jewellery feel but with an elegant and effortlessly cool edge, a look that A Peace Treaty succeeds in delivering time and time again. 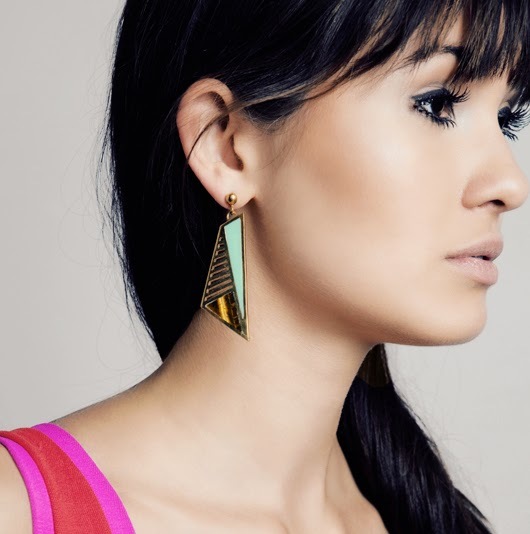 The matching Nvda earrings have an unusual cutout shape that sits beautifully against the face. The combination of mint resin and tiger eye create a look that is so incredibly unique and beautiful, we feel it would make a striking addition to any Summer, holiday or festival wardrobe. A Peace Treaty, you have quite simply done it again!